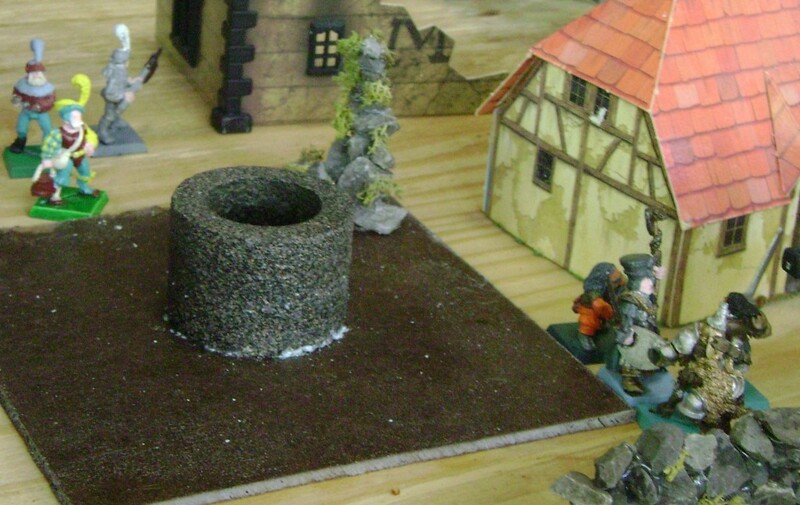 First, we set up a simple game between the two new people doing a skirmish scenario so they could learn the basics. They played as Undead and Pit Fighters. However, because neither of them had their own models we had to use some of our extras, so we ended up with an army of Undead that didn’t look very Undead, and a band of Pit Fighters that looked more like knights. After a couple rounds of the practice game we decided to play a 5 player scenario. 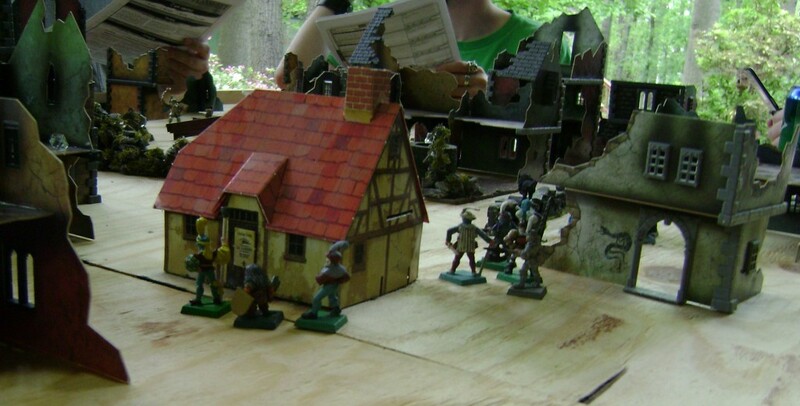 We used the Mordheim Annual/Town Cryer Chaos in the Streets scenarios and ended up playing Treasure Hunt. 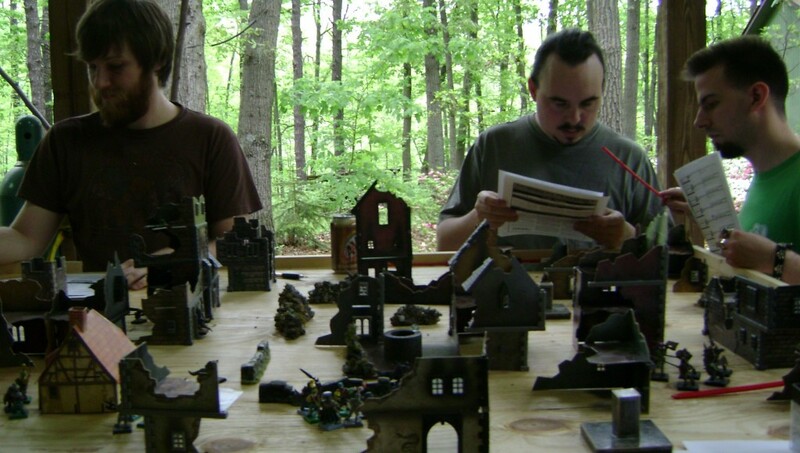 I played as my Possessed, Tewfik as his Skaven, and the other 3 were the Undead, Pit Fighters, and Beastmen. There were battles going on all over the place. Possessed met with the Pit Fighters and the Beastmen. The Pit Fighters and Undead were battling Skaven, and the Beastmen were battling not only the Possessed but fending off undead as well. Meanwhile, a lonely little dreg was managing to run around picking up several Wyrdstone shards. 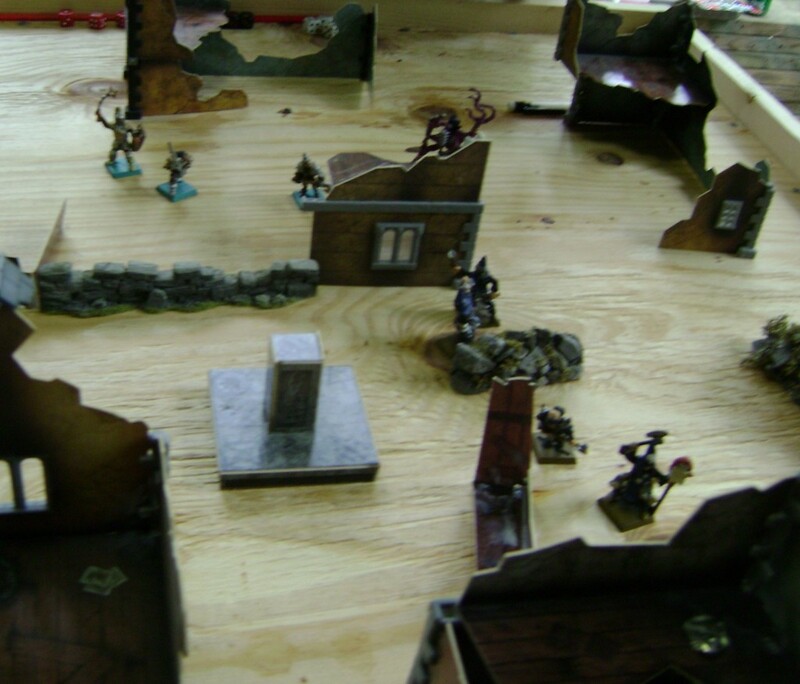 After about 4 or so rounds the Possessed voluntarily routed with only 2 remaining guys (both Brethren Henchman). 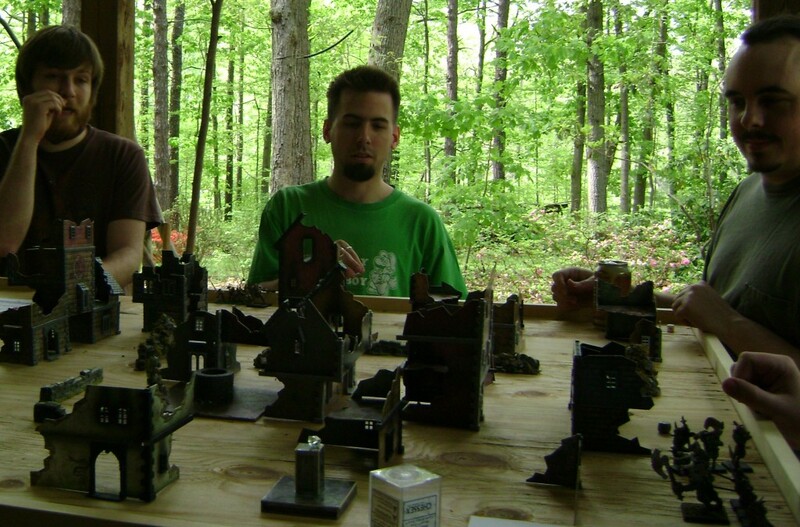 Shortly after the Skaven failed a rout test and left the battle. 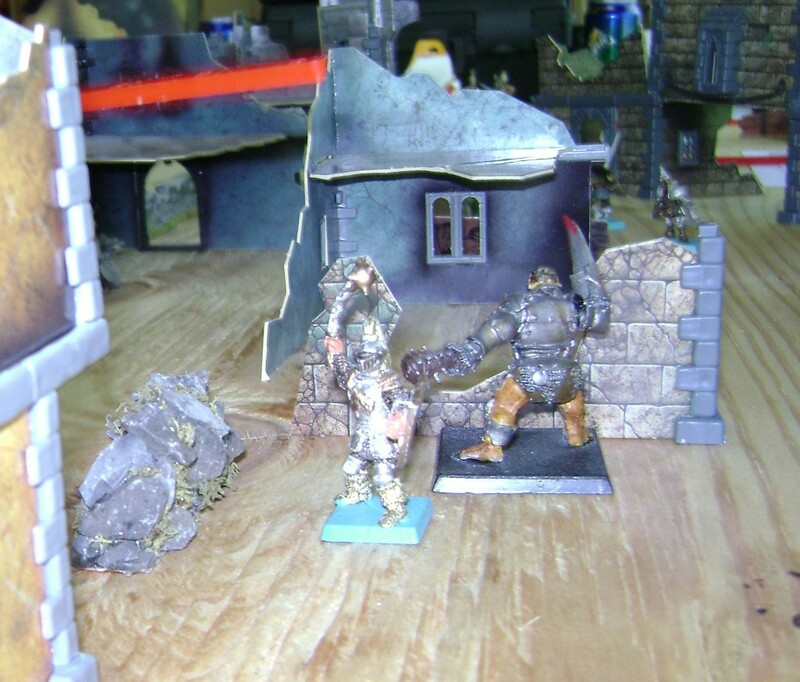 The battle continued, with the B eastman and Undead battling it out pretty hard, both losing several units. Unfortunately for the Beastmen they failed their rout test the turn after the Minotaur entered a frenzy. The remaining Pit Fighters and Undead charged at each other (while the one dreg slipped around untouched going after more wyrdstone). The Pit Fighters were in pretty good shape having only lost 1 guy, but they only had 5 to start with. The Undead had lost several units in the battle against the Beastmen, but still outnumbered the Pit Fighters. 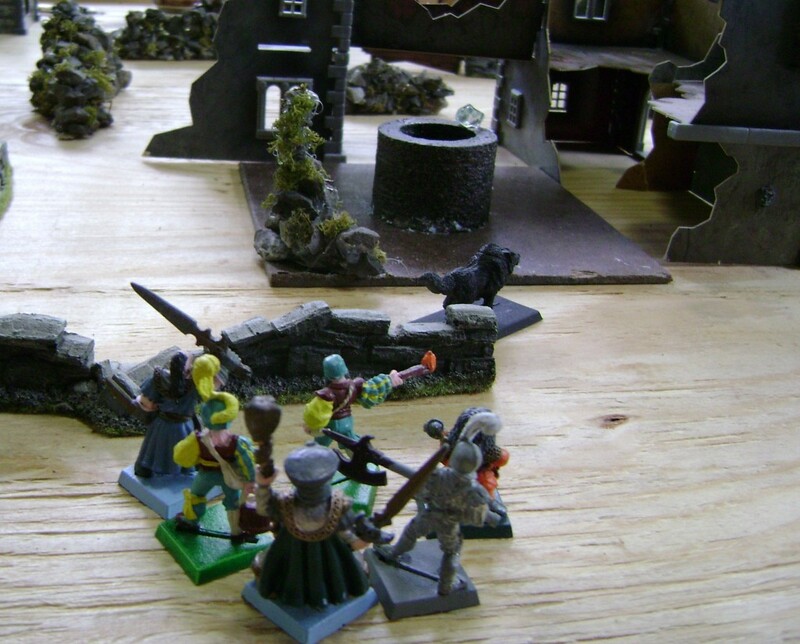 In the end, though, the losses from the Beastmen caused the Undead to rout, leaving the Pit Fighters victorious. For the most part, no warbands lost much of importance in the post battle sequence… except the Possessed. One of my 2 mutants was captured by the Pit Fighters who ransomed him back for all 40 of my remaining gold crowns. My other mutant and a darksoul perished. The Undead lost 2 henchman who were easily replaced by the 3 pieces of wyrdstone the lone dreg collected, along with 3 more pieces of wyrdstone from exploration. By the time this battle ended about 6 or 7 hours had passed since we started setting up, so we didn’t get the chance to play another game. 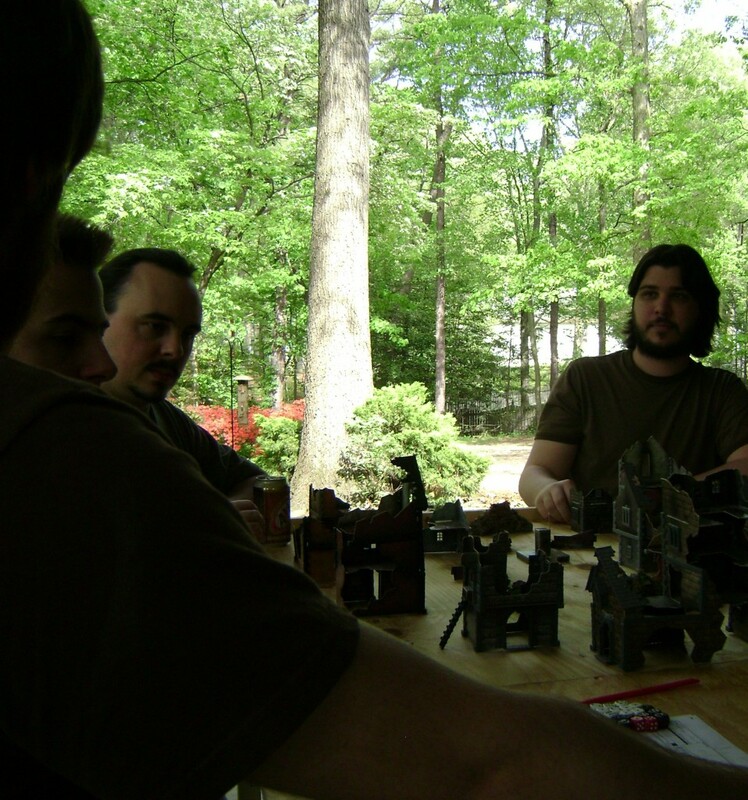 We are hoping to finish some terrain before the next gathering so we can set up both halves of the table and play multiple games at a time. 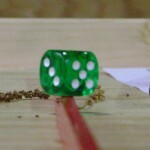 Overall, the first use of the table was a great success! 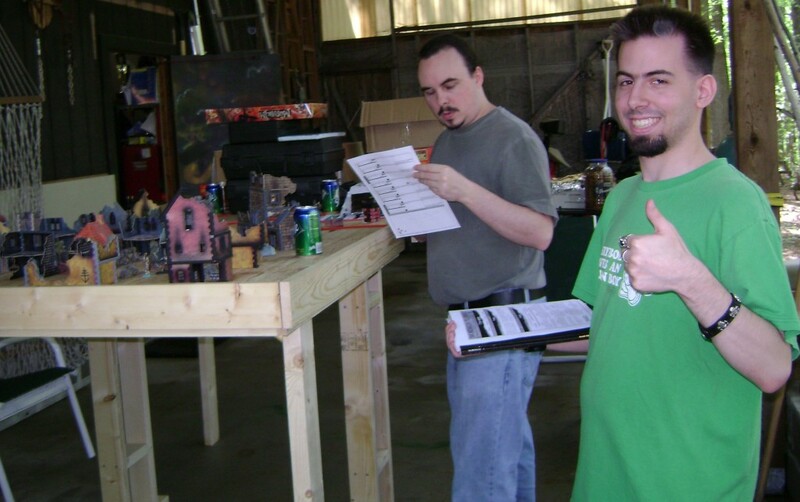 This entry was posted	on Monday, May 11th, 2009 at 9:24 am	and is filed under Battle Report, Miniatures, Table. You can follow any responses to this entry through the RSS 2.0 feed. You can leave a response, or trackback from your own site. 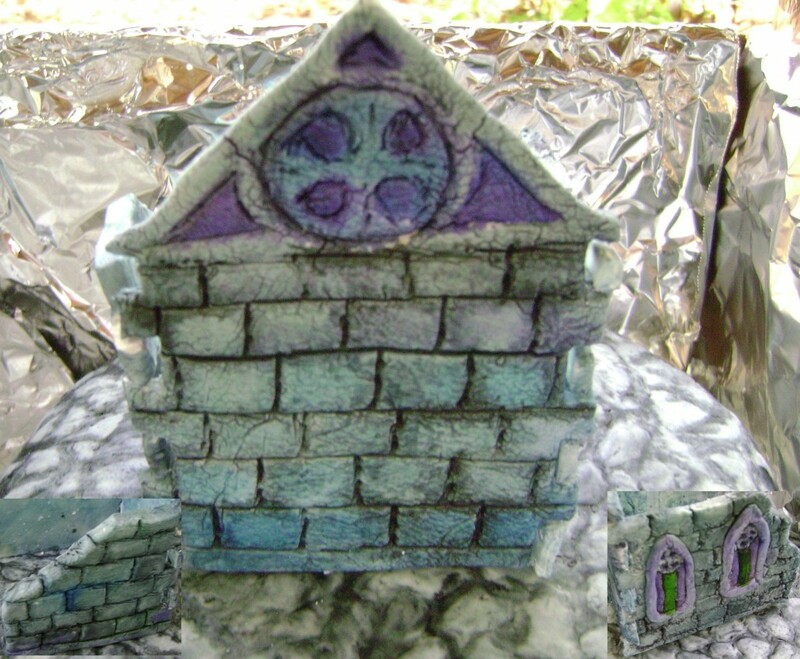 Wow great cake, and pics! I wish i Was there, but next time. I am working on some of that much needed scenery, i have got a 6×12 inch house needing the finishing touches and paint and its good to go. 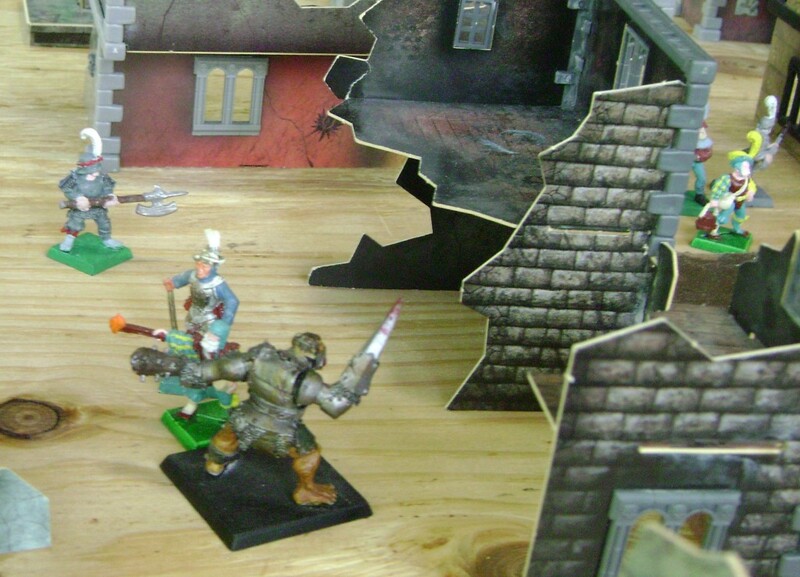 http://hobbyblog.wargameweaver.com/mordheim (it’s the Lost Chest scenario). Lovely table, Gorgeous forest you guys live in. Wow. I am looking forward for more exciting battle reports like this, maybe something from Warhammer 40k or something. 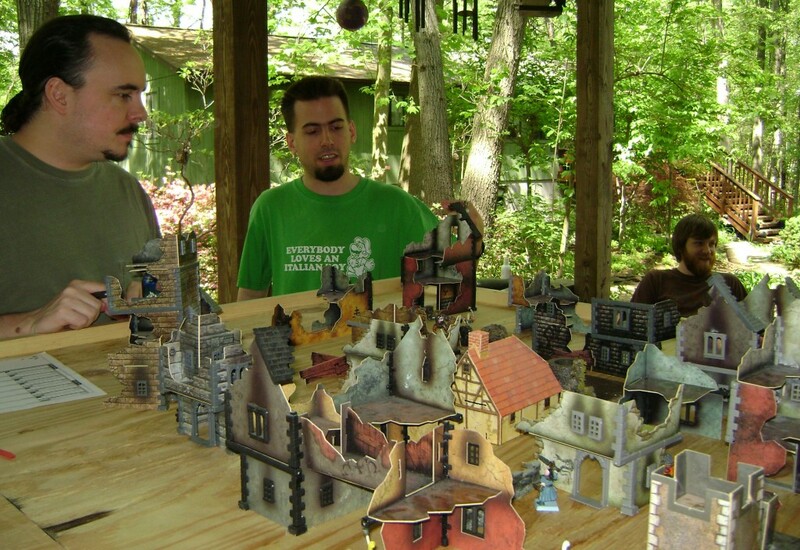 Does the scenery come with Mordheim or is it separate? Powered by WordPress v 5.1.1. Page in 1.803 seconds.